Elkford Part of the BC Adventure Network. Over a million web site visitors annually ! Climate: Elkford has a moderate climate with warm summers and relatively mild winters. The proximity of the town in the High Rock Mountain Range greatly influences the weather patterns. The high elevation of the community generally results in a reduction in the severity of winter cold periods while keeping summer heat from reaching extreme temperatures. Access: Elkford is served by a paved two-lane, provincial highway which is regularly maintained and snow cleared. 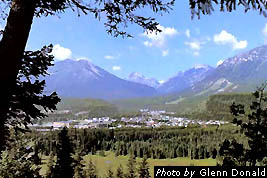 Highway 43 intersects Highway 3 (the Crowsnest Pass) at Sparwood, linking Elkford with Alberta, Cranbrook and beyond. Aircraft can land at the Elk Valley Airport 20 km south of Elkford. This modern aircraft landing strip, operated by Elk Valley Air Services, has a 4,000 ft paved runway. Small planes and helicopter charter services are available. Greyhound Bus Lines operate out of Sparwood providing passenger and freight services. Leyden Bus Lines, Dickens Bus Lines and Koltran Coach all provide charter bus service in the Elk Valley. Recreation Facilities & Activities: heli-skiing, ice-climbing, hang gliding, mountaineering, horseback riding, river rafting, kayaking, fishing, wildlife viewing, birdwatching, biking, hiking, golf course, ski area, wetland tours, and snowmobiling. Summer Sports Spectacular: With over 40 km of maintained hiking and biking trails in and around town, Elkford is fast becoming a major destination for wilderness enthusiasts. There are several easy to moderate trails suitable for outings of half a day or less. Elkford offers the perfect location for all fisherman. Whether you are a professional fly fisherman or a novice spin caster, or somewhere in between, Elkford is the place for you. There are many fishing areas with easy access, as well as secluded locations that will require some hiking. A must see while in the area for any outdoor enthusiasts is the magnificent Elk Lakes Provincial Park, Josephine Falls and the Greenhills Viewpoint. Many old logging and exploration roads now serve as mountain bike and ATV trails. Contact the Elkford Chamber of Commerce for a map of the area. Great Golfing: Mountain Meadows Golf Course is a well-manicured 9-hole golf course situated off Highway 43, it hosts many water hazards to challenge even the experienced golfer. Winter Sports Galore: The Rocky Mountains are well known for ample snowfall, downhill and cross-country skiers benefit. Elkford's local Wapiti Ski Hill offers weekly night skiing and day skiing on weekends. Rates can't be beat and lines are usually very short. During the winter months many of the old logging and exploration roads are used for cross country skiing or snowmobiling. Contact the Elkford Chamber of Commerce for a map of the area. Snowmobiler's Paradise: Elkford is a "snowmobiler's paradise" and offers spectacular sledding opportunities that range from family outings to breathtaking mountain challenges. Many of the trails travel through large mountain basins, high mountain passes and beautiful valleys - all providing spectacular riding opportunities. Contact the Elkford Chamber of Commerce for a map of the area. Elkford's Leisure Opportunities: If the great outdoors is not quite your style Elkford offers a wide variety of recreational opportunities. The Recreation Center houses a 3-sheet curling club and lounge, a full size hockey arena and concession, a banquet hall with full kitchen facilities, meeting rooms and a playschool. There are 6 ball diamonds, numerous playgrounds, tennis courts, horseshoe pits and a running track at the secondary school. The Elkford Aquatic Complex is a fully equipped handicapped facility that boasts 4 swimming lanes, a kiddy wading pool, a whirlpool hot tub and a sauna. The Elkford Public Library contains over 20,000 titles for children and adults besides many magazines and reference books and promotes the Project Literacy Program. Elkford's Amenities: After a full day of swimming, skiing or hiking try one of Elkford's restaurants or pubs that offer a variety of settings and cuisine's. Shopping varies from a retail mall to a wide variety of home-based businesses. Elkford has numerous accommodations to keep you warm at night, 1 motel, 1 hotel, a Municipal Campground and several Bed and Breakfasts. Elkford offers many youth and adult organizations -- something for everyone from Girl Guides/Scouting to a 50+ Club. Other service Clubs such as the Lions have chapters active in Elkford. For your spiritual needs, Elkford has Catholic, Alliance, Congregational, Pentecostal, Lutheran and Baptist churches.